Resolved updating defined filters while in paused state which provides IT Professionals and Developers an additional tool to isolate issues in high trace flow environments. Fixed Find Again command missing matching entries. Fixed issues with multi-line messages. Applies more strict filter with RegEx when finding the uls log files in the log folder so that non-uls log files are not picked. To download the ULS Viewer visit http://www.microsoft.com/en-us/download/details.aspx?id=44020. WssDownload tool has been relasead. You can use this tool for download all documents in a Document Library as preventing folder structure to your server harddrive. If you wonder why have i developed this tool , consider a scenario that publishing feature is been corrupted or not activated and windows explorer view not running and you have hundreds of files in your library, how could you download them manuelly ? so i think it is clear that you can use it . 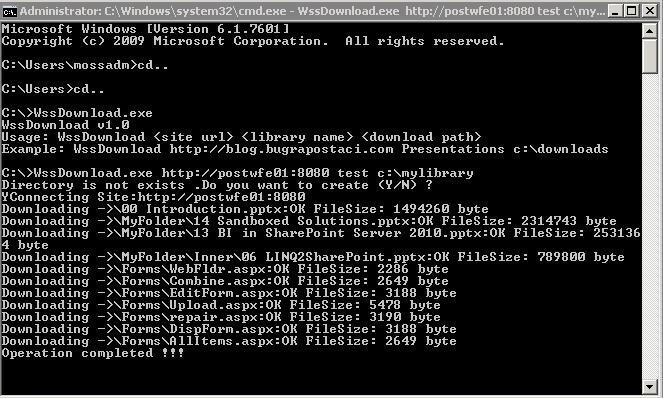 WssDownload x86 can be used 32 bit Sharepoint 2007 systems. WssDownload x64 can be used both Moss2007 x64 and Sharepoint 2010 systems.